'Violins Of Hope': Instruments From The Holocaust A violin maker in Israel has spent more than two decades painstakingly amassing a tragic collection: instruments played by Jews during the Holocaust. He calls them "Violins of Hope," and they will be displayed for the first time in the United States, and featured in a series of upcoming concerts. 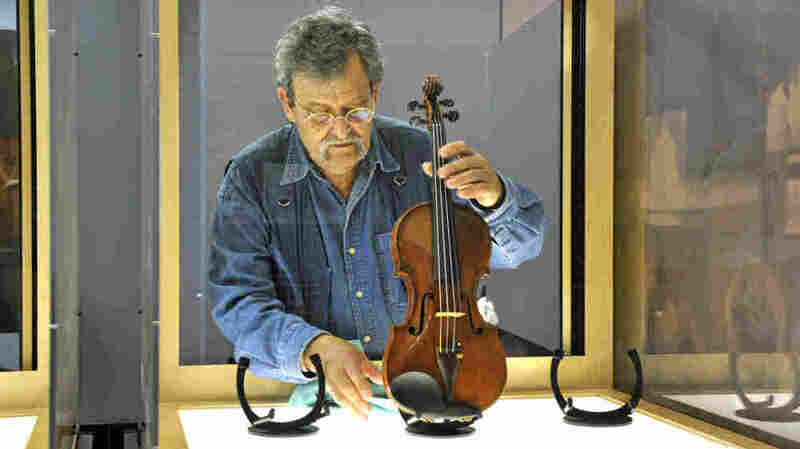 Amnon Weinstein prepares a violin from the Holocaust for exhibit. He began restoring the violins in 1996 and now has 30 of them to display in an exhibit called Violins of Hope. Amnon Weinstein first encountered a violin from the Holocaust 50 years ago. He was a young violin maker in Israel, and a customer brought him an old instrument in terrible condition and wanted it restored. The customer had played on the violin on the way to the gas chamber, but he survived because the Germans needed him for their death camp orchestra. He hadn't played on it since. "So I opened the violin, and there inside there [were] ashes," Weinstein says. Weinstein was horrified; were these incinerated remnants of concentration camp victims? The Nazis plucked Jewish musicians from arriving cattle cars and forced them to play as other prisoners went to their death. Hundreds of Weinstein's relatives — grandparents, aunts, uncles, cousins — died in the Holocaust. To handle one of those instruments was too much. "I could not. I could not," he says. It was many decades later in 1996, when Weinstein was ready. He put out a call for violins from the Holocaust. One came from a survivor who played in the Auschwitz Men's Orchestra. 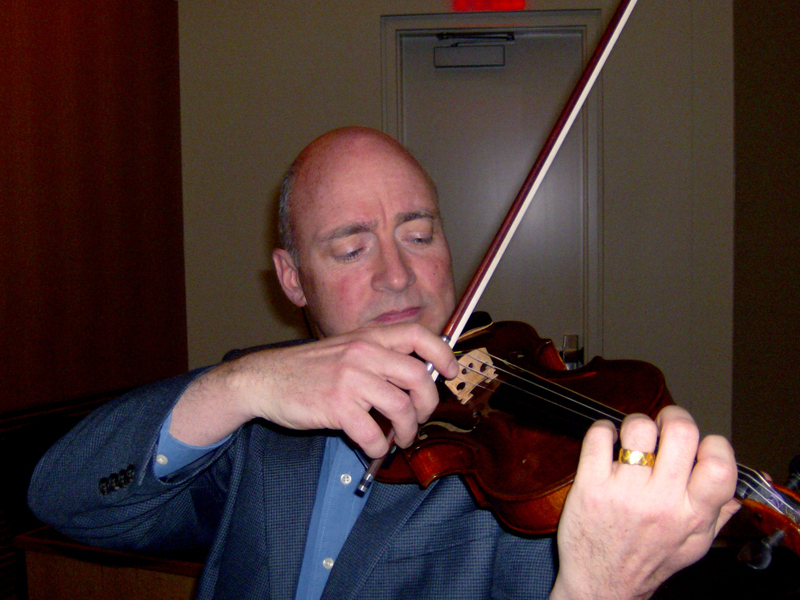 UNC Charlotte music professor David Russell plays a violin that belonged to a member of the Auschwitz Men's Orchestra. On a recent day, the violin was being played by David Russell, a music professor at the University of North Carolina, Charlotte. Russell and Weinstein are old friends, which is how Charlotte came to host the North American debut of Violins of Hope. Eighteen instruments are here; Russell says each carries the touch and playing style of its previous owner. "When I play one of these instruments, I go through that same process of discovering what makes this instrument sound the best," Russell says. "That means that I'm walking in their footsteps and their voice is actually heard by my playing of this violin." The violin was perhaps the most important instrument for the Jewish people, Weinstein says. He has restored more than 30 Holocaust violins, and many are inlaid with an intricate Star of David in mother-of-pearl. Orthodox Judaism forbade displaying portraits or sculpture, so Weinstein says violins often hung as art on the walls. "Never [would you] see a Jewish house without an instrument on the wall. It was a kind of tradition," he says. Weinstein began collecting these violins to honor that tradition, but also to break the silence: His family never spoke of the Holocaust. Once, he asked about his grandfather and says his mother silently opened a book about the war and pointed to a pile of bodies. 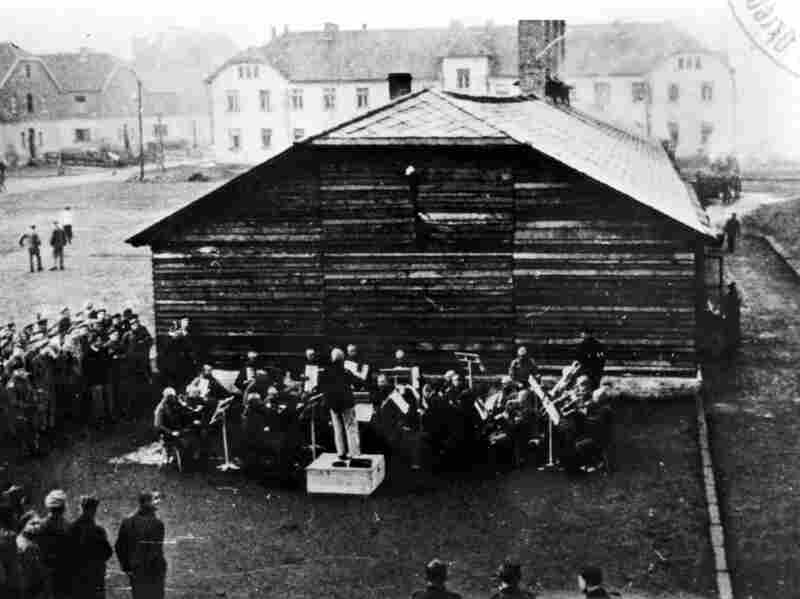 The Auschwitz Men's Orchestra is seen here in an undated photo. Jewish musicians were forced to perform in Nazi concentration camps. Weinstein then married Assi Bielski, whose father was a famous Jewish resistance fighter portrayed in the film Defiance. Weinstein was amazed how happily the Bielski family talked about the war. "We are completely different in this way," he says. "Her family killed Germans, by quantities, not by one. My family was all killed by the Germans." Bielski says her family was always very happy, and they were not humiliated. "It's the number tattooed on your arm that is a constant reminder of the humiliation," Bielski says. "For us there was none of it." Weinstein says that perhaps what he's doing with the violins is to make his life a little bit easier from "all [of] this heritage, which is unbelievable." The Violins of Hope are Weinstein's resistance. They're like tombstones, he says, for the thousands of Jewish instruments and musicians destroyed in the war.